/ Modified mar 31, 2015 12:28 p.m.
Gov. Doug Ducey, Jan. 13, 2015. Gov. Doug Ducey Monday vetoed legislation that would allow police agencies to keep private for up to 60 days the names of officers involved in shootings. The bill was one of three Ducey vetoed Monday. He signed two other bills into law. The Republican governor, going against the legislative strength of his own party, said he worried that the 60-day limit in the police officer's name bill was arbitrary. 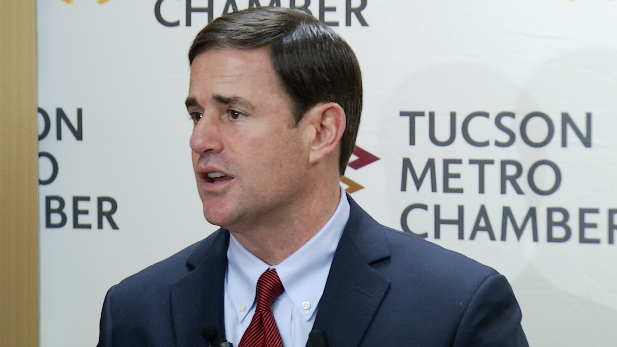 "I don't believe this bill in its current form best achieves the objectives we share, and I worry it could result in unforeseen problems," Ducey said in his veto letter. Republican lawmakers, led by Sen. Steve Smith of Maricopa, pushed the legislation because they said officers involved in shootings often become the object of threats. Vetoed a bill that would have limited municipalities in setting quotas on numbers of traffic citations issued by officers and enforcement personnel. He said it would keep police chiefs from objectively assessing their forces' performances. Vetoed a bill that would have categorized farm animals differently than household pets for purposes of determining animal cruelty. Signed a bill that will index income tax brackets for inflation, eliminating what he and Republican legislators called "a hidden tax increase." Signed a bill that keeps women from getting abortions using health insurance acquired through the federal marketplace in the Affordable Care Act. The bill also would require physicians to tell women receiving medication-induced abortions that the procedure can potentially be reversed. Legislative Roundup: Elections Changes, Predicting Crime AZ WEEK: Legislators Aim to Adjourn in Two Weeks METRO WEEK: What Impact Do Tucson Lawmakers Have on Arizona Legislature?